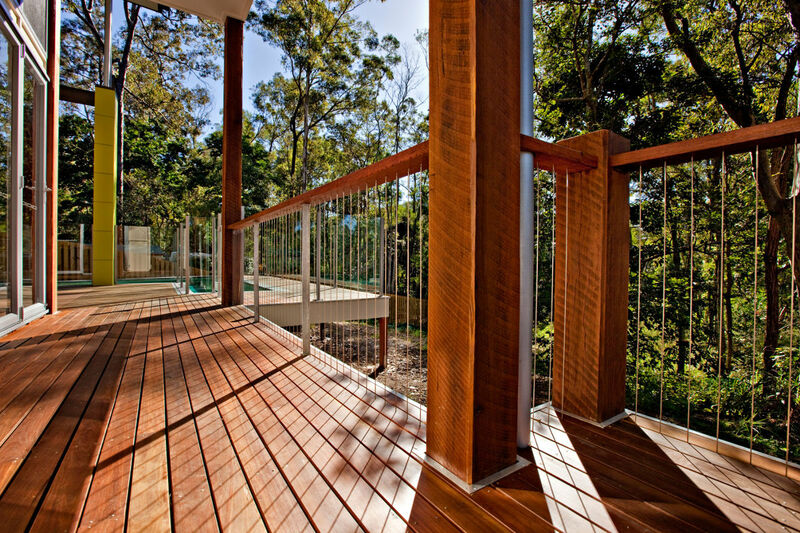 Beautiful timber posts have been tilted and turned, timber decking intersects at unexpected angles and simple galvanised steel is married with the elegance of stainless steel to highlight the natural beauty of solid hardwood. 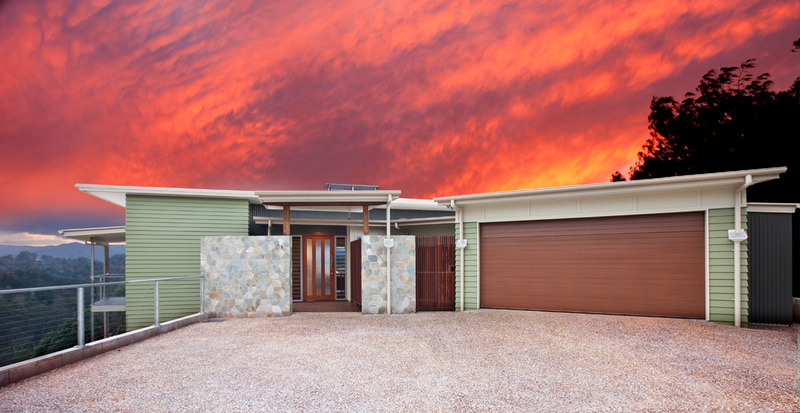 Soaring nearly 5m high and wrapped in Colorbond zinc the entrance has a barn like appearance, defined by a Bloodwood tree through the roof. 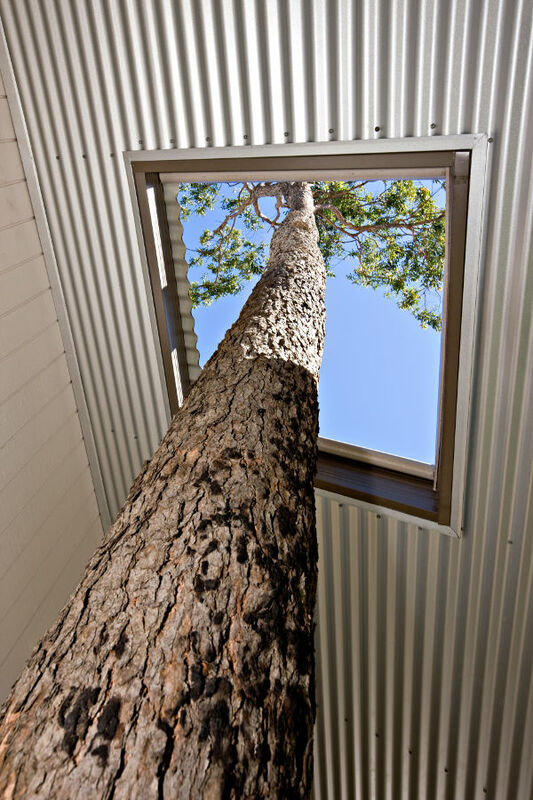 This provided an innovative solution to the requirement that the tree had to be retained and has become the defining feature of the home. Beautiful timber posts that have been tilted and turned support the dramatic entrance. 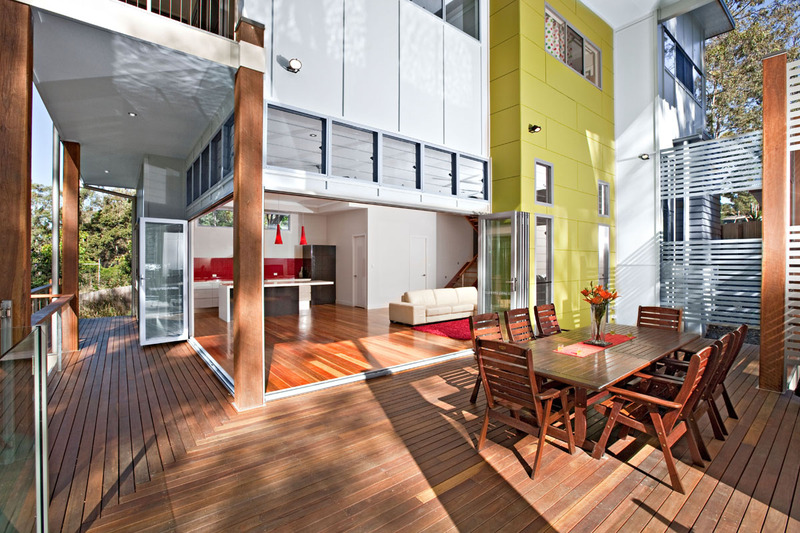 This creative idea has been used throughout the home to promote continuity of design and materials. This continuity is also evident in the use of Colorbond materials in the kitchen (as a splashback) and in the bathrooms (in the showers instead of tiles). 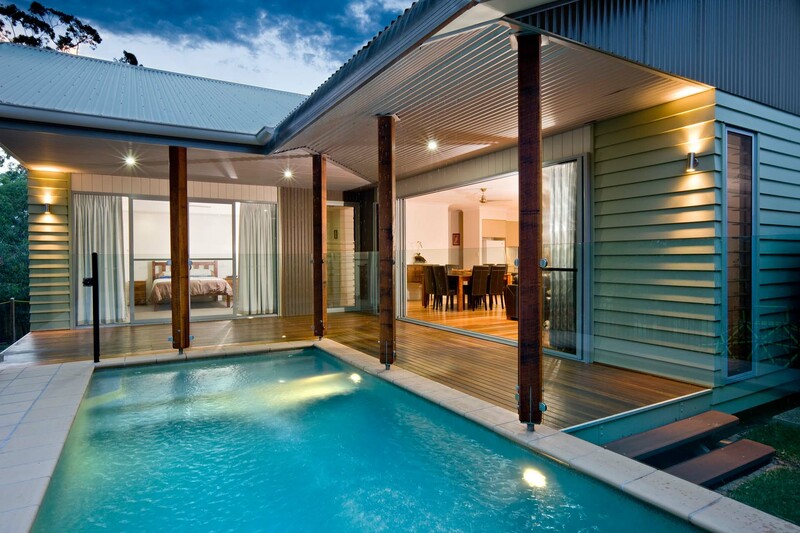 Continuing the use of timber, locally sourced Spotted Gum flooring is used extensively through the home, flowing seamlessly onto the poolside decking, providing a functional and stylish entertainment area that is truly integrated into the rest of the house. 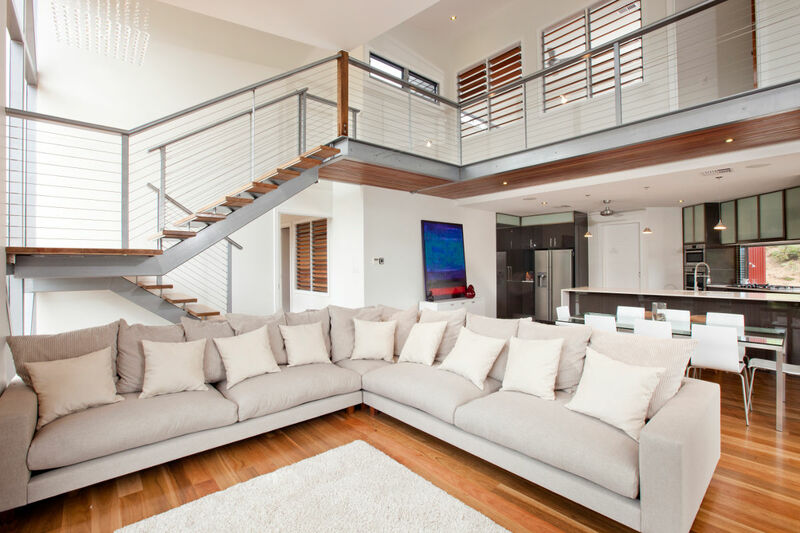 This is complemented by a large open plan living space enabling the owners to see the pool from all living areas; a must for a family with small children. 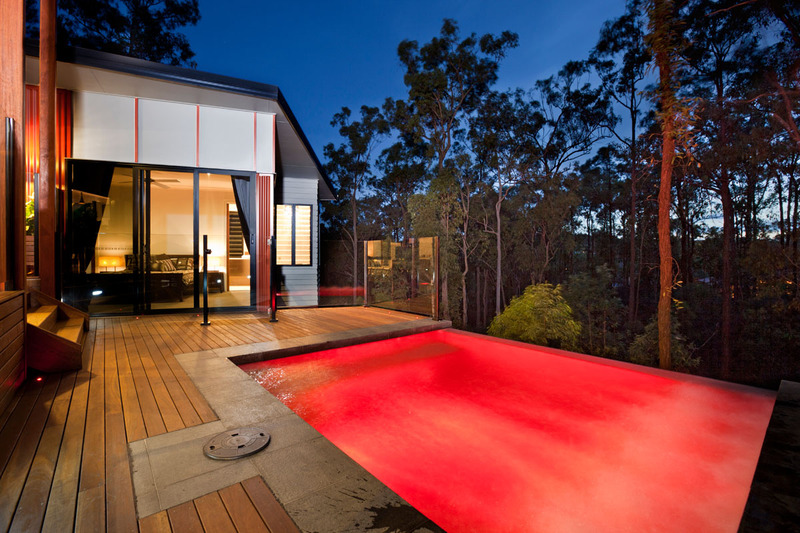 Another original feature designed by Kaha Homes is a natural waterfall into the pool, created by the partial removal of the gutter on the roof overhang allowing rainwater to flow directly into the pool, thereby saving valuable tank water as well as providing a unique experience during downpours! 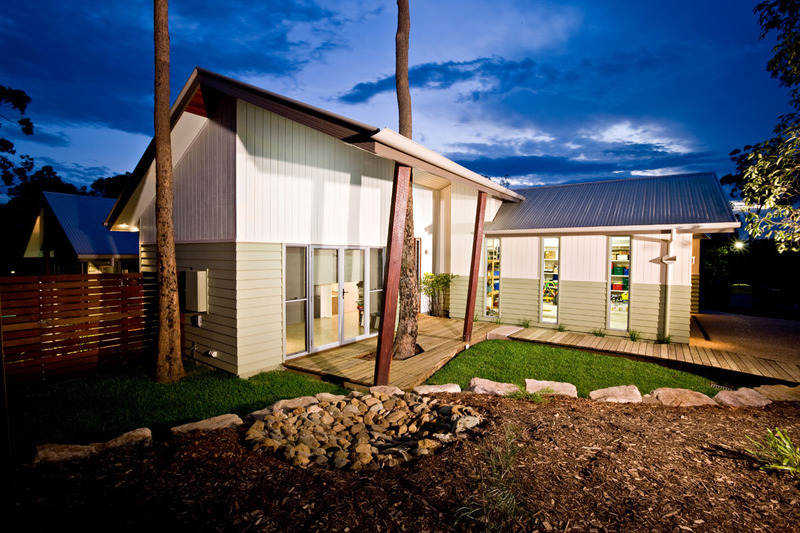 The home was designed to seamlessly integrate with the natural bushland setting to give the impression that the home grew up around the trees. This has been achieved by the creative mix of colour and materials drawn from the surroundings and deliberately chosen to blend with the landscape rather than stand out from it. 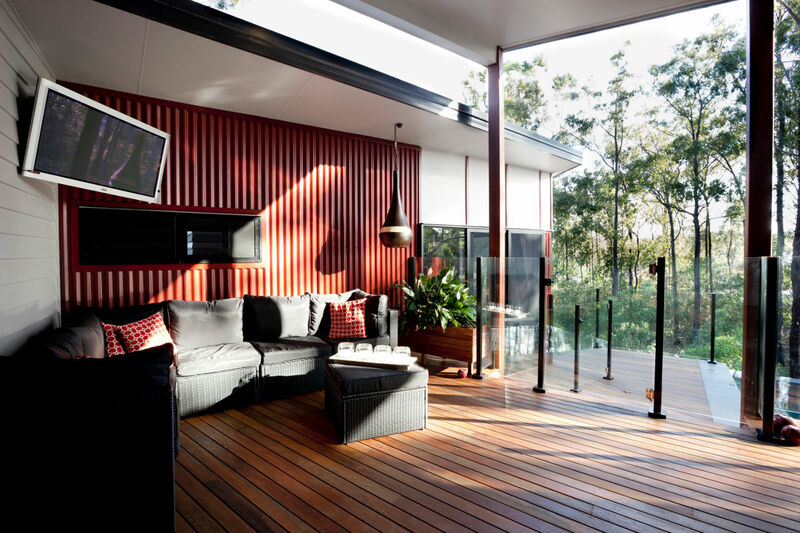 To accommodate the natural contour of the sloping block the living area has been stepped down from the polished concrete entrance by wide Spotted Gum stairs, creating a stylish and unique definition between the functional and living areas of the home. 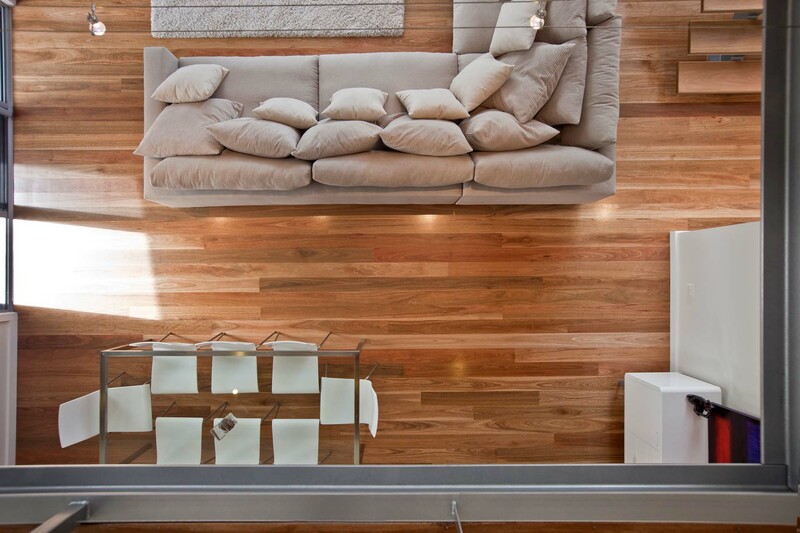 Where the living area is stepped down oversized ceilings increase the overall feeling of spaciousness. The study has been positioned at the front of the house; allowing easy access for people visiting the home as well as minimising disturbances from the rest of the house. The polished concrete flooring continues into this room, offering stylish looks as well as superior functionality. The home is finished in neutral tones, which complement the natural colours and textures of the timber floors and stone kitchen benches. 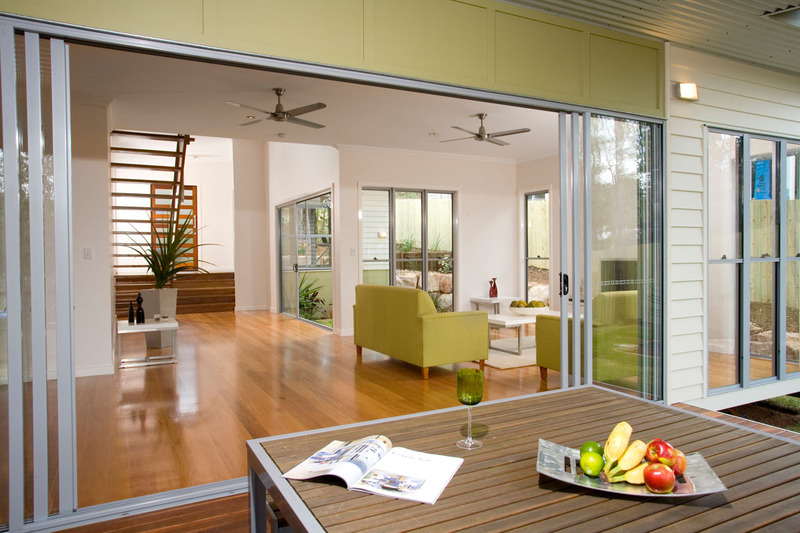 To ensure a clean, fresh look the same doors were used throughout the home with sleek brushed satin chrome handles. Quality stainless steel appliances and premium fixtures and fittings complete the look of this stunning.